Ask A Gardener is passionate about planting and offers a specialist service within this sector. 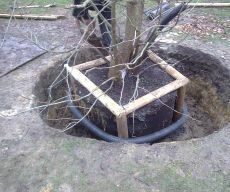 We have a vast range of experience from planting whips and canes to semi mature trees and everything inbetween. Planting in any garden or outdoor space enhances the appearance of the landscape with an instant effect. Whether you are looking for a new design or to replace a current species that has died, we can provide the service you require. 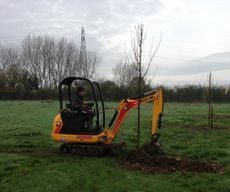 We are able to source, supply and plant any tree, shrub or hedge species native to Europe, alternatively if you have already acquired your species than we are more than happy to just plant it for you. Preparation is key in providing the best start for your new plants, starting with the aspect, soil condition and potential hydrogen of the soil, this can all be determined with a site survey. It is important that you tell us of any underground services that we could potentially come into contact with. In considering the needs of the plant we can offer a range of services including underground pinning, staking and installation of water coils. We can also alter the Ph of the soil, making use of ericasuos soil or lime supplements as needed. The optimum timeframe for planting is between October and April (providing the ground is not water logged or frozen), however a site survey can determine if planting will be successful at other times of year depending on the species, desired position and condition of the ground.